For two generations, spanning more than 30 years, Thuro Metal Products has purchased quality, used automatics, attachments and spare parts from Graff-Pinkert. The relationship is one which we've enjoyed from a personal and business standpoint. The Graffs have displayed an ongoing passion for the craft of production machining. They have not only been a provider of the hardware needed to compete, but also insights into the field. Our industry is definitely a better place due to Graff-Pinkert's ongoing involvement, insight and support. Regarding the excellent care and service we received from Graff-Pinkert technicians Manny and Julio. Our 1-3/8" Wickman 6-spindle had stopped the night before on 2nd Shift, so we started the week with what appeared to be an electrical/mechanical issue. Since we are located in central Minnesota, finding someone to help us get back up and running is not an easy task. Graff-Pinkert is our primary source for all things Wickman, so we began by calling them for ideas. Over the next 5-6 hours and several phone calls, Manny (one of Graff-Pinkert's Wickman rebuilders) and Julio (Graff-Pinkert's electrician) took us through a number of steps to isolate the cause. Their knowledge of the entire machine (1-3/8" Wickman) and possible issues continued well past their (and our) normal work day, but resulted in our getting the machine back "up." Having spent a couple of calls with them on the phone myself, I was impressed with their professionalism in the area of customer service. Both my operator and myself apologized for having to call more than a couple of times, to which we were assured that this was OK and that they wanted to help us. This was my first time working with Graff-Pinkert technicians, and I am impressed with them, just as I have been for a long time with the rest of Graff-Pinkert's staff. Lloyd Graff (President and Owner of Graff-Pinkert & Co.) should feel privileged and proud to have such fine people on the Graff-Pinkert team. Graff-Pinkert has been a solid supplier and partner to us over the years. We’ve purchased numerous pieces of equipment from them. Their prices are always fair and they have always stood behind what they sell. I’ve never gone there and found a machine to be anything other than what they tell me it is. In the world of machinery dealers this is truly something special. Funny, I didn’t have to think to write this, because I know it’s been the truth. Meaden Precision has been doing business with Graff-Pinkert for 30 plus years. During this time we have experienced excellent customer service by their knowledgeable sales staff. It doesn’t matter if I am purchasing a 1 ¾" Wickman or a $10.00 replacement part, every order is processed quickly and in a professional maner. Bottom line, Graff-Pinkert helps keep our machines running! 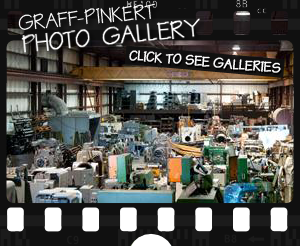 I've had a very good experience buying machines, spare parts and tooling from Graff-Pinkert. On a scale of 1 to 10 I would give them a 10. I've been doing business with them for the last 10 years and I would definitely recommend them to other manufacturers. They are very serious people and very honest. I have known Lloyd Graff and the folks at Graff-Pinkert for 20 years. Over that time we have completed dozens of deals taking turns as the buyer and seller of equipment. Without exception, I have come away from each deal with a great respect for Lloyd and his organization. I know Lloyd to be a man of his word, which in the used machinery business is a trait I that I put the highest value on. I have also found that Graff-Pinkert has some very highly skilled technicians who have done excellent work on some of the equipment I have purchased. All this, along with their guarantee makes dealing with Graff-Pinkert an experience I would recommend to anyone. Lloyd Graff and I started doing business together back in the early 1990's. Our first deal together was a company called Spangler. We learned of this opportunity and together, did a thoughtful analysis of the best approach to win the deal and then how to best monetize the assets. We were able to flip the deal as a going concern for a healthy profit. A total “Win-Win” for everyone. Lloyd inspired me though his thoughtful approach and analysis of all aspects of the deal. Lloyd has had a tremendous impact on my life and its direction. He is not one to act out of routine but rather to think well outside of the typical “Get it done quickly and move on to the next deal” box. That was one of my defining moments. That is when Lloyd introduced me to Dan Sullivan, the Strategic Coach. Lloyd had discovered a concept unusually thoughtful, organizational, socially responsible and well packaged. Lloyd’s kind introduction to Dan opened my eyes to a completely new way of thinking and acting to break though the glass ceiling of complexity that we each experience at some point. I thank you Lloyd for caring enough to bring me into your inner circle and providing me with great mentoring and support over the years.